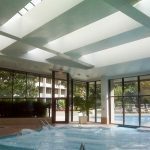 Skylight Specialists, Inc works with architects, builders, property managers/owners, general contractors, corporations, educational facilities and local, state and federal governments. We provide cost-effective, time-efficient solutions to new installations. 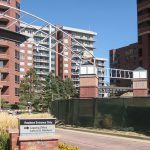 A Denver, CO company, our team of Installation Specialists are trained, willing, and available to work in the continental US. You will find the savings produced by completing your project in a timely manner and correctly the first time outweigh our travel costs. 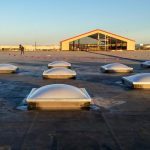 Since 1980, we have installed or repaired nearly all major brands of commercial daylighting systems and are certified installers for CPI Daylighting, Skyline Sky-Lites, Velux and others. Our teams have successfully completed a wide range of projects for property managers/owners, general contractors, corporations, educational facilities and local, state and federal government. The result of our efforts—better planning, better execution, better quality installations, and fewer problems—is well worth your investment of time and money. Detailed information on all new installation projects on our site. REQUIREMENTS: This unique project was designed to take an ugly, dirty-looking nine story parking building sitting in downtown Seattle and modernize its appearance while protecting the cars and people using the space from inclement weather. An opaque wall was not an option for obvious reasons, including safety. Some of the walls were curved. All work had to be completed from the interior. Deliveries at night and with low ceiling height restrictions. Keeping parts of the structure open to the public to insure continued income for the owner. Keeping the public safe and at bay. Acquiring all necessary licenses and building permits—no mean feat! Accurately locating all existing handrail posts. Installing the product from the interior required specialized equipment. Maintaining straight and plumb installation—including a continuous curve—for nine stories. Coordinating work with all other trades involved in the major overhaul. 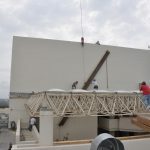 24,000 sqf of a Pentaglas® single panel system weighing less than 2 lbs/sqf installed from the first to the ninth floors. 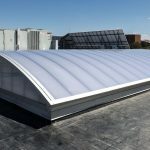 The ice white matte finish, standing seam panels were installed in reverse, providing a seamless flush look to the exterior—a “Times Square” look. The Pentaglas® system design allows areas of the garage to be enclosed, while keeping others open for ventilation.